Listen Up! 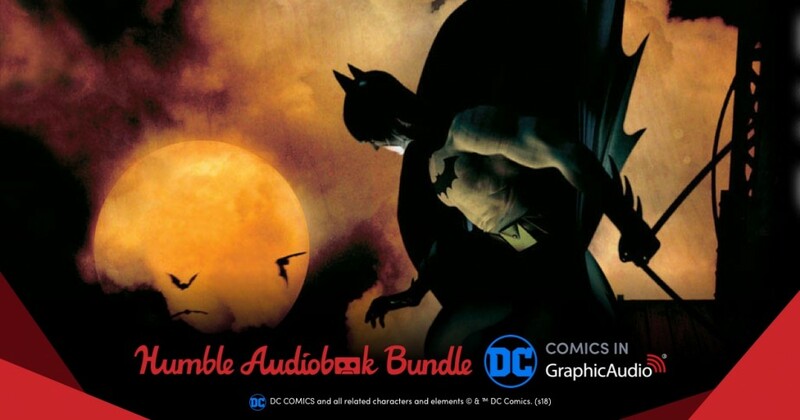 DC Comics has joined with Humble Bundle to create a a giant Audiobook Bundle that benefits Comic Book Legal Defense Fund and Hero’s Initiative. Pay what you want to get the best in Audiobooks produced by GraphicAudio, delivered to your ears instantly. Get these full cast stories featuring favorite characters like Batman or The Flash and support Comic Book Legal Defense Fund’s important work fighting on the front lines of free expression. For those who have never experienced the brilliance of Audiobooks by GraphicAudio, it is like getting the biggest and best summer blockbuster playing in your brain. Plus audiobooks let you take the movie with you! Listen to Superman save the world when you walk your dog. Hang out at your gym with Bruce Wayne. Entertain the whole family when you drive to Grandma’s with the Justice League. The movie quality scripts and acting will immerse you in the DC Universe no matter where you are. Bundle buyers choose where their money goes – among DC Comics, Comic Book Legal Defense Fund, and Hero’s Initiative. If they like what Humble Bundle does, they can leave a Humble Tip too. Audiobooks are available to download in MP3 and FLAC formats, meaning you can listen to them anywhere at any time. Instructions can be found here. DC Comics is one of the largest and oldest American comic book companies, and produces material featuring numerous culturally iconic heroic characters including: Batman, Superman, and Wonder Woman.